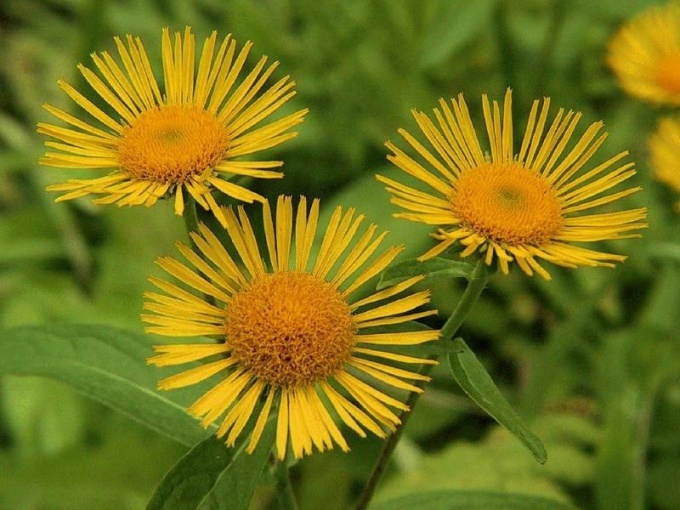 In olden days it was believed that the plant inula 9 has magical powers, so from 9 cures diseases, and protects healthy people from all sorts of ailments. In fact, this medicinal plant helps in fighting with lot of diseases, because it is so popular in folk medicine. From it is prepared teas and infusions. For medicinal purposes is the rhizome. The chemical composition of the roots of a rich and diverse: here there are resin, tocopherol, alkaloids, inulin, gum, mucilage, wax, essential oil and pigment. And in the roots of elecampane contain potassium, iron, manganese, calcium, magnesium and other micro - and macronutrients. That is why the elecampane has expectorant, anthelmintic, antiseptic, anti-inflammatory and other valuable properties. It is prescribed for chronic respiratory diseases, scurvy, hepatitis, nausea, diseases of the joints, dermatitis, boils, etc. Harvest the rhizome of elecampane in the fall (from the beginning of fruiting until the first frost). The excavated raw shake from the soil, washed and dried at room temperature. - 200 ml of water. Root pour boiling water, bring to the boil, then cook the mixture over low heat for 13-15 minutes. Next insist broth 3.5-4 hours and filtered. Take this drug 1 tbsp. l. three-four times a day until recovery. It is important to follow the exact dosage at reception broth inside. - 1 Cup of water. Roots crushed, pour boiling water and cook for 3-5 minutes, then insist 1 hour and filtered. Take broth 1 tbsp. l. three-four times a day for as long as the disease does not recede. The rhizome is crushed, pour cold water, bring to the boil, then cook 7-10 minutes, cooled and filtered. Drink this tea to ¼ Cup to a full recovery. - 2 cups of broth of rhizomes of elecampane. Herbs pour boiling water, bring to a boil, and then enrich the composition of the decoction of the rhizome of elecampane and again bring the mixture to a boil. Brew tea for 8-10 minutes, and then insist his 28-30 minutes and filtered. Drink the medicine after meal 1 tbsp. l. three-four times per day during the month. - a glass of water. Root, pour hot water, the mixture is brought to a boil, then cook on low heat for 3-5 minutes and allowed to cool. Compress is recommended leave for 1-2 hours. The roots fill in with cold water, bring the mixture to a boil and slowed down the heat to low, cook 4 hours. Next, the broth is filtered. The finished product is used for bath and wash. It is not recommended to take medicines which consists of nard, persons suffering from diseases of the cardiovascular system and kidneys, as well as during pregnancy.